Everybody knows the new year really starts the day after Labour Day, no matter what the calendar says. So, hi. How you been? Hard to believe summer is almost over (mostly because it took so long to start). It’s been a great few weeks. We spent time at a cottage at the beach, at another one in the woods, at a condo in the big city, and here. Good mix of stuff, and I’m ready to get back into the school routine. With a new wrinkle added in: I’m gainfully employed! Since I haven’t worked for so long, I feel like a bit of a dinosaur (I work in IT, and seven years out of the market is essentially the equivalent of being a doctor and trying to start practicing medicine again after a break, and the last time you practiced, you used leeches). I’ll be doing product support for some customized software, and it’s part-time, so I’ll be working on the days when Vorlon is in school. And it’s a 20 minute walk from my house. It’s just about perfect. We’ll see how that goes. Wanida, from Sock Innovation. I’m happy with the final product – this is the sock blank I dyed last fall, and I really didn’t like how the colours turned out. But this pattern seems to have worked pretty well for it. It doesn’t get too lost in the colour changes, and it was interesting enough to work on to distract me from the barfy colour combination. Lift and Separate, from Big Girl Knits. Again, very happy with this. It looks really good (picture notwithstanding – I was using the camera with the timer, and trying to fend off the kids who were very interested in the photographic process). Hasn’t been nearly cold enough to wear yet, but that’ll happen soon enough. 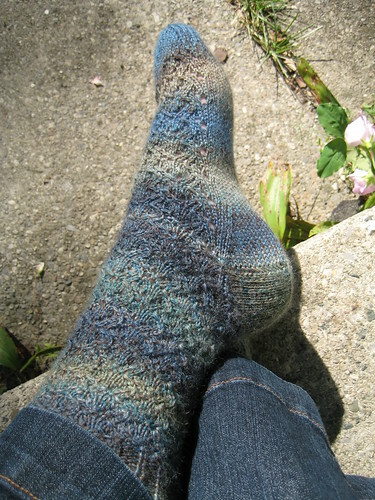 Glynis, again from Sock Innovation. It took me a sock and a half to finally memorize the pattern, which is good to keep me interested, and the yarn (Patons Kroy FX) might just be my favourite sock yarn ever. I got to work with it last year before it was released into the market and talked about it here. Triinu, from Lace Knitting in Estonia. I just love it. This is less than 50 g of Elann Laceweight yarn. I think it’s destined for Dr. Thingo’s grandmother. 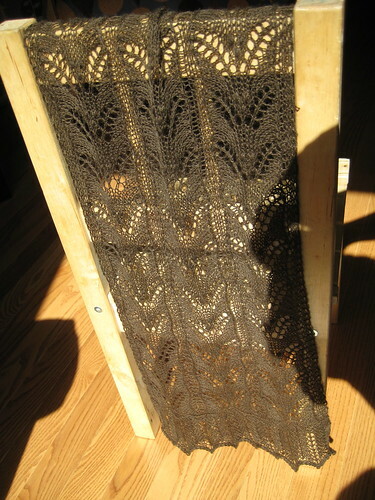 Incidentally, I have a really hard time photographing lace. 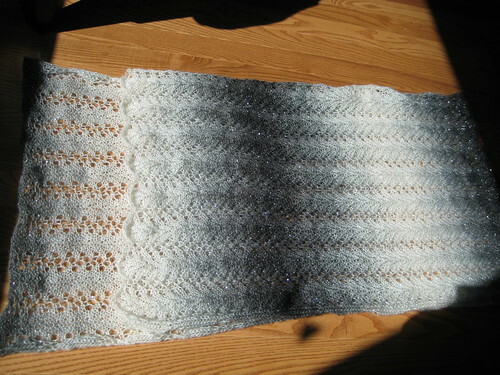 If I put it down somewhere, the lace pattern somehow becomes invisible in the picture. If I hang it up, with a light source behind it, it gets washed out, and if I do it like I did with the light source in front, the shadows detract from the lace pattern. Knitting photographers out there – what do I do? 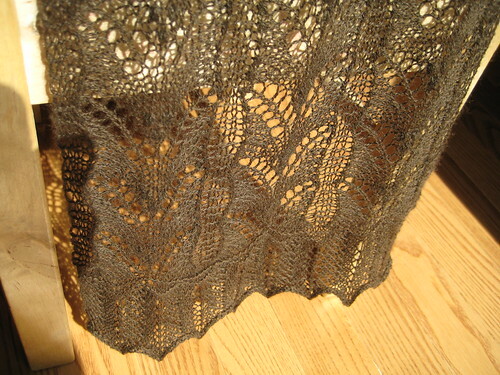 A lace shawl for Spinrite, from a previously released pattern, so I’m guessing it’s to showcase the yarn, which came with no ballband. It’s a fairly heavy laceweight, with nice, slow colour changes, which would be fine, but it’s also got a ply of sparkly metallic thread (you can sort of see it in the picture). I don’t particularly like the sparklies, but Zebula thought it was awesome. And that’s it. Not bad for a month or so of work! Though I’m pretty sure than once I start work, the knitting productivity will drop sharply, so don’t get used to it. 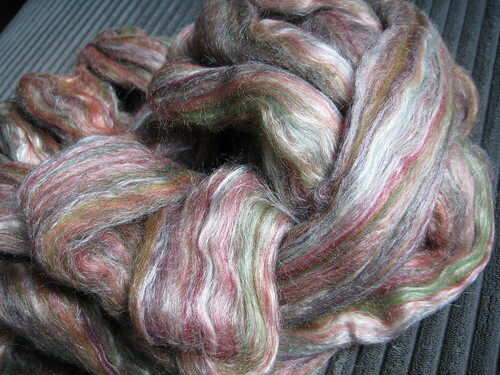 I have done a small amount of spinning in the past couple of days. I finally pulled out this top, which I bought in Seattle three years ago. It’s 80% merino, 20% silk. And it’s been sitting in the basement for three years because I was always a little afraid of it, because it’s so pretty. But I finally decided to bite the bullet. This stuff, as it turns out, pretty much spins itself. I just have to pull some off, loosen it up a little bit, and it just magically turns into a fine singles with just a little assistance from me. I’m in love. 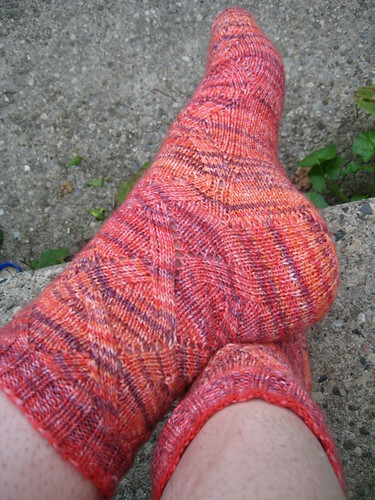 I’m currently working on Cauchy (again, from Sock Innovation. I’m planning on making all the patterns from the book. Because I’m crazy) in a different colourway of the Kroy FX, and I’m finishing an afghan. A man contacted the Knitters’ Guild about finishing an afghan for his mother who had to move to a retirement home and can no longer knit, so I volunteered. It’s patchwork style, different coloured squares and it’s mostly done. I’ve done about half the squares I need to do. But I’ve run into a snag with the yarn in one colour and ran out of one of the other colours, and I’m not sure we’ll be able to get more because it’s this acrylic from at least 20 years ago. This stuff is hard. Remember what the polyester clothes felt like in the early 80’s? Like that. Anyway, I’m not sure if I’ll find more. I have to consult with the son to see what they want to do. I also have a commission to work on a sweater for Clevermonkey. This is going to be nice! He got himself a pile of Philosopher’s two-ply in natural sheep colour, and I think we’ve settled on this. I am waiting for a copy of the pattern it was adapted from to arrive in the mail, and will start work soon. 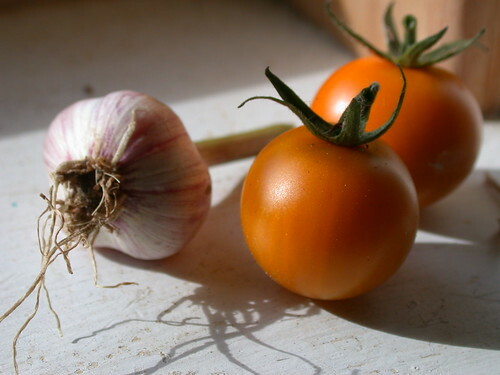 Tomato and garlic. 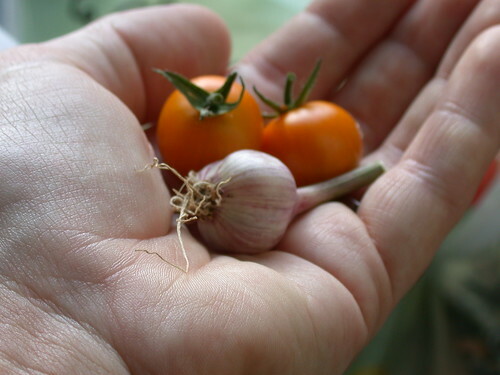 Only, the tomatoes are cherry tomatoes, so the garlic is really teeny. I have five heads of wee garlic. Bonsai garlic, I call it. I’m going to keep one and split the cloves to plant in the fall and eat the rest. The cherry tomatoes have been doing very well, and we’ve slowly been eating them over the past few weeks. My big tomatoes are just on the verge of ripening. And I have about 10 volunteer tomato plants in the front bed where the corns, beans and squash were meant to be. They’ve grown like mad and are sprawled all over the place since they’re not supported, and they have lots of fruit. But since they started so late, I don’t think we’ll get anything for another couple weeks at least. Which means I will probably just have a big pile of green tomatoes for relish, since the nights have been getting pretty cool, and a frost can’t be too far in the future. Speaking of corn, beans and squash, here’s my corn crop. 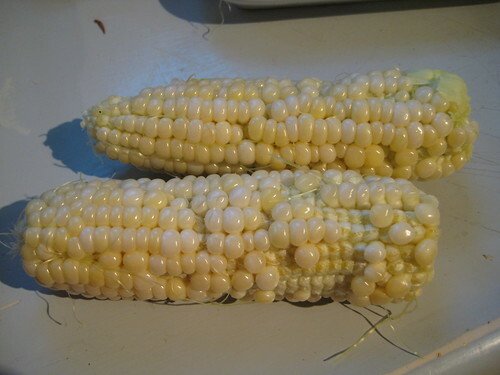 Yep, that’s two ears of short, gnarly corn. But it was tasty. I got one late squash plant in a shady corner of the bed with blossoms on it. I’m not sure anything will come of it, but I’ll leave it there. And the beans should be harvested soon, since they’re getting pretty dry. Have a nice Labour Day!